Raise your hand if you like tasty, filling, healthy, and inexpensive recipes. We’re all raising our hands correct? 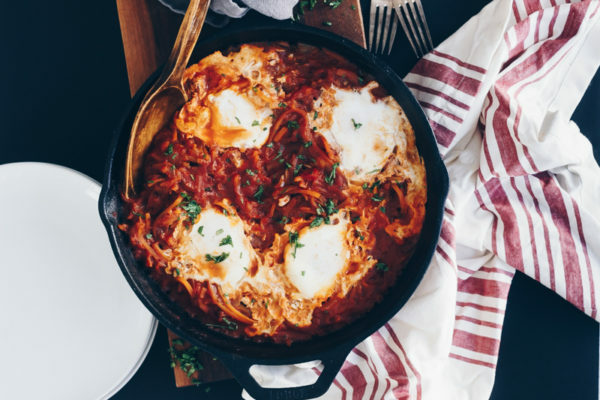 I know I am and I bet you’re going to love this Smoky Chipotle Butternut Squash Shakshuka as much as I do! Let’s face it, eating grass-fed and organic meats for every meal can add up quick. That’s why I try and add a few meals per week that are just as nourishing but use less expensive ingredients. 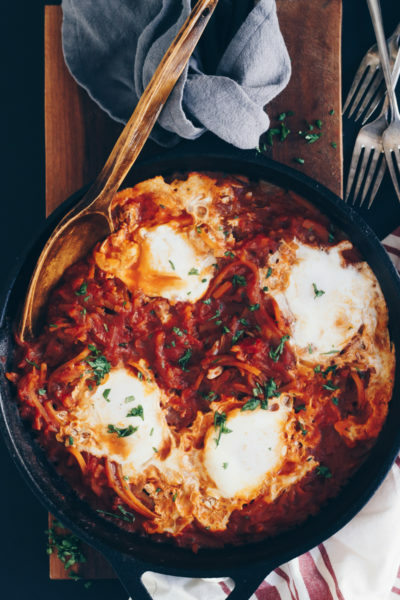 Canned tuna and sardines are a go-to, so are eggs. Eggs though aren’t too exciting on their own so we’re jazzing things up with an added starch in the form of butternut squash, some spice from some chipotle peppers in adobo sauce, some onions and garlic, all simmered away in crushed tomatoes. The butternut squash is especially great in this since it adds a hint of sweetness that balances out the spice nicely. To make this a quick meal I like to use spiralized squash when softens up in just a few minutes. After sautéing some onion and garlic with the squash you’ll add in the chipotle and adobo along with the tomatoes and simmer that for a few minutes so it will thicken. After that you’ll just make a few divots in the sauce, crack in a few eggs, put a lid on it and simmer for 5 minutes or so until the whites are set but the yolk still jiggles when the pan is shaken. A sprinkle of cilantro and you’re ready to dig in! One more note, if you don’t have chipotle peppers in adobo or can’t find a clean version you can swap in some ground chipotle chili pepper plus a splash of apple cider vinegar for the added tang that would’ve come from the adobo sauce. Start with a teaspoon of spice and vinegar and add in more until it reaches your preferred spiciness level. If you’re using the whole pepper start with one and go up from there. I usually use two since I like a lot of spice. Heat the oil in a large deep sided skillet over medium high heat. Once hot add in the diced onion and minced garlic, saute for 1 minute until fragrant. Add in the spiralized squash and cook 3-4 minutes until it starts to soften. Mince the chipotle peppers and add them to the skillet along with a tablespoon of the adobo sauce. Pour in the crushed tomatoes and simmer 5-7 minutes until the sauce has thickened. Taste for salt and add a pinch if needed.